infographic | Piktochart Infographic Editor. This week I would like to share three resources I recently discovered and I think are worth exploring. 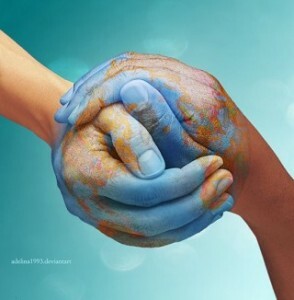 #1: PBIS (positive behavior interventions and supports) World is an excellent, free and user-friendly resource for addressing behavior through research-based interventions. It contains links to hundreds of interventions, supports, resources, and data collection tools, all of which are organized into a tier 1 through 3 in a prevention-oriented framework. Designed by a social worker, the purpose is to help guide users through the PBIS implementation process, starting with behavior identification and offering suggestions for interventions. It is ideal for therapists, teachers, counselors and parents. There are 36 behavior options to choose ranging from Bullying to Poor Peer Relationships. After choosing an area of concern, it takes you through a series of options based on the user’s response, ‘Does this describe the student’? If the user’s response is ‘yes’, it offers a track with related interventions, if the response is ‘no’ it offers a different track of options. Suggestions are offered in tiers with many simple strategies for reducing the target behavior including worksheets, games and activities. It is suggested that Tier 1 interventions are implemented for at least 6 months before moving on to Tier 2. If interventions are not working at Tier 2, then there is a Tier 3 with more intense interventions. There are data tracking forms for teachers and therapists to document how each intervention is working. Antagonize others, instigate, pushy, etc. Each intervention option has accompanying strategies and activities to address the area of concern. This is one of the most valuable resources I have found for working on social skills and addressing behavior. If you like this site, refer it to a colleague or parent. Recent research suggests that children with autism have a very strong interest in the use of iPads. They work like a computer, which is predictable. Templin Grandin serves as one of the most accurate ‘windows’ into the world of autism. Identified with autism as a child, she has become a leading advocate for autistic communities and has been a symbol of hope for parents who have autistic children. Temple Grandin says, “Words are like a second language to me. I translate both spoken and written words into full-color movies, complete with sound, which run like a VCR tape in my head. When somebody speaks to me, his words are instantly translated into pictures” (1995). She shares how she processes more effectively in pictures and suggests that other children with autism likely do too. 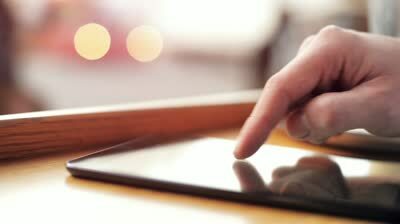 The iPad is a small computer with pictures and icons that moves with the touch of a finger. As Lesley Stahl reports, touch-screen app are giving autistic people new ways to express themselves, some for the first time (2014). She adds that parents are hailing the technology as a breakthrough (2014). The use of iPads in the community is also increasing communication skills. When ten students were placed in community employment settings, nine out of ten individuals reported being understood every time they attempted to communicate with their iPad (Price, 2014). The iPad is a tool to support communication, however, it is not a cure for autism. The iPad cannot be the only source for learning and communicating. A structured school environment, collaborative therapists and a family that actively participates in the child’s learning are very important and play an equally significant role. Providing the autistic child with opportunities to experience practical, meaningful learning should be provided with and without technology. Temple Grandin says, “The most important thing people did for me was to expose me to new things” (1995). For a child with autism, there must be a balance with all accessible tools and strategies in order to facilitate the most functional communication and most meaningful interaction possible. Grandin, T. (1995). Thinking in pictures: My life with autism (1st ed.). New York: Doubleday. Kagohara, D. M., van der Meer, L., Ramdoss, S., O’Reilly, M. F., Lancioni, G. E., Davis, T. N., Sigafoos, J. (2013). 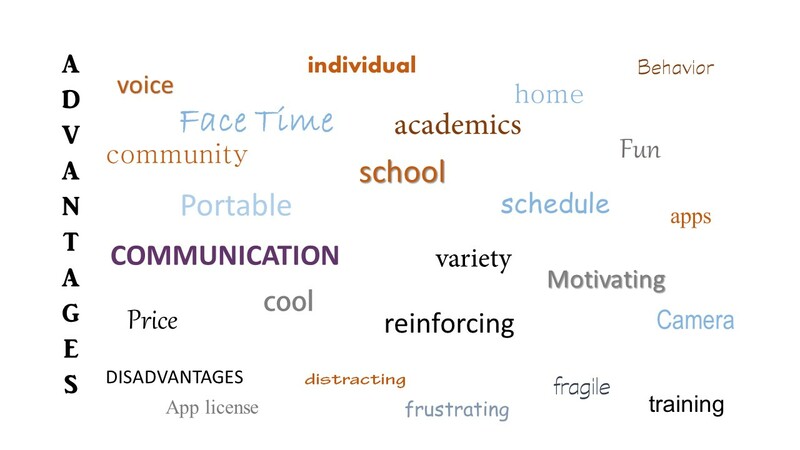 Using iPods[R] and iPads[R] in Teaching Programs for Individuals with Developmental Disabilities: A Systematic Review. Research in Developmental Disabilities: A Multidisciplinary Journal, 34(1), 147–156. Palmer, R. (2013). Accessibility: The Top 10 iPad Apps for Special Education. T.H.E. Journal,40(6), 10–13. Price, A. (2014). Autism and iPads. Teacher Librarian, 41(3), 40–41. There have been times in our lives when we wished we would have kept a thought in our head and not expressed it to others. It’s those times, we should have used our THOUGHT BUBBLE. We communicate our feelings, thoughts and ideas during conversation with others. However, not everything we think needs to be said. Sometimes expressing thoughts out loud can be inappropriate, annoying, uninteresting or rude. Children who are not careful about what they say to others are at risk for social difficulties. As they get older, inappropriate comments can lead to socially awkward, confusing and even dangerous situations. A thought bubble is a place where ideas that are not shared by others are kept. Words that are not appropriate for the conversation can stay in our heads, safely in the thought bubble. 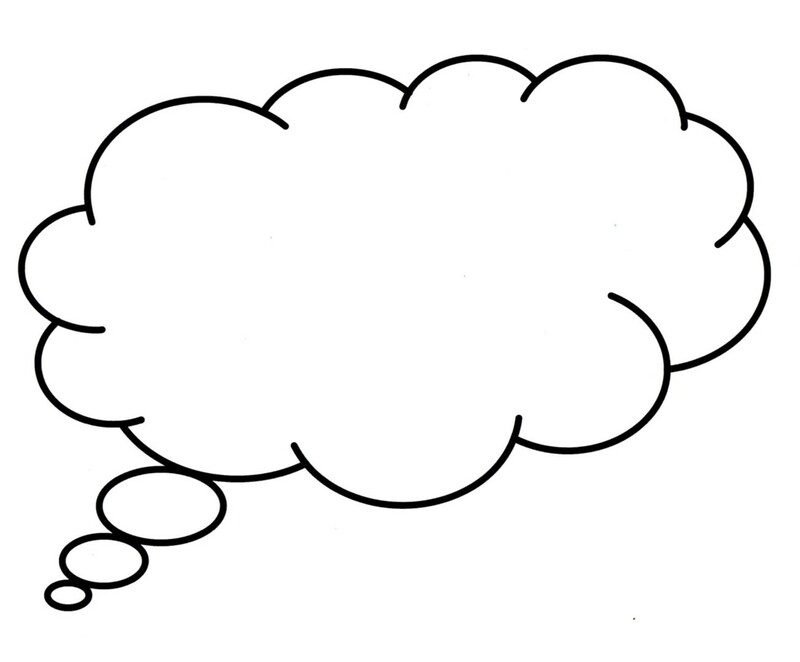 We can use the ideas kept in our thought bubbles to practice what we want to say. Not everything we think needs to be said. If we think about something that is not related to the conversation (for example, thinking about dinosaurs when everyone else is talking about movies), we keep that in a thought bubble. Baltazar Mori, A. & Bonfield Piantanida, D. (2007). Every child wants to play. Torrance, CA. Pediatric Therapy Network. Willey. L.H. (1999). Pretending to be normal: living with Asperger’s syndrome. London, England. Jessica Kingsley Publishers. Williamson, G. & Dorman, W. (2002). Promoting social competence. San Antonio, TX. Therapy Skills Builders. This is the first of nine posts addressing multiple intelligences and how we can support our little thinkers. Musical Intelligence involves the capacity to perceive and express musical forms, including understanding rhythm and patterns. People who demonstrate a high degree of musical intelligence may be ideally suited for musical professions, such as composing or playing an instrument. Christopher Pappas suggests multimedia presentations and use of music that emphasizes the subject matter. He suggests that it creates a more immersive experience for the learner. The use of background music during homework or independent work within the classroom. Our students with language delays and/or learning challenges have a less efficient left hemisphere, where language is importantly involved. Tapping out patterns for words, sentences and memorization tasks (like spelling words and learning their phone number), so processing is simplified and information is more likely to ‘stick’. Introduce children’s books on tape for another wonderful way to access our musical intelligence learner. As educators and parents, we do our best to assist our students in reaching their highest potential. We want them to succeed and agree that technology is an enormous component of their future, even if we don’t fully understand it. I see many of the multiple intelligences feeding into our 21st century learners. 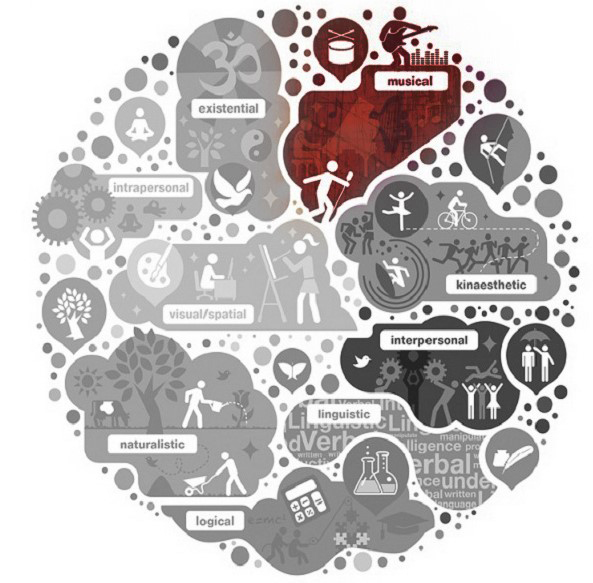 I will be writing a series of posts based on Gardner’s Multiple Intelligences. I will be providing suggestions on how to access our special 21st century learners, based on their most apparent and strongest intelligence. 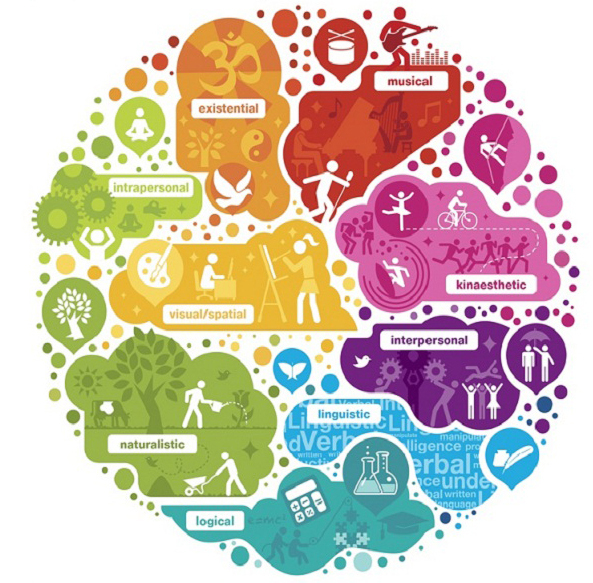 I will include some suggestions that I discovered in a great article by Christopher Pappas, who outlines how we can use these multiple intelligences in eLearning situations. There has been an increase in young adults with autism spectrum disorder (ASD) participating in college with accommodations and modifications for academic support. However, one of the most identifying characteristics of ASD is deficits in the areas of behavior and social skills. Without support in these areas, students may not reach their highest potential (Mason, Rispoli, Ganz, Boles, & Orr, 2012). This study investigated the effects of effects of video modeling without additional treatment components to improve social-communicative skills, specifically, eye contact, facial expression, and conversational turn-taking in two college students with ASD. The results suggest that both students improved with the opportunity of watching socially appropriate modeling. Based on this study, I would anticipate that providing video modeling along with social skills training for college student with ASD, could significantly improve their interactions and overall success at the university level. Mason, R. A., Rispoli, M., Ganz, J. B., Boles, M. B., & Orr, K. (2012). Effects of video modeling on communicative social skills of college students with asperger syndrome.Developmental Neurorehabilitation,15(6), 425–434. The use of the iPad for children with special needs is being experienced around the world. The apps are endless and new apps are being developed at 20,000 per month. The student’s access for developing communication, social and academic skills are available in a new way with the use of the iPad. When we think of 21st century learners, it includes more than our general education students. It’s about all of our students learning with technology and contributing to society to the best of their ability. Our children with special needs are part of that dynamic contribution.